Real Housewives creator Andy Cohen forced out of his spacious office at 30 Rock and shuffled downstairs to a tiny cubicle. 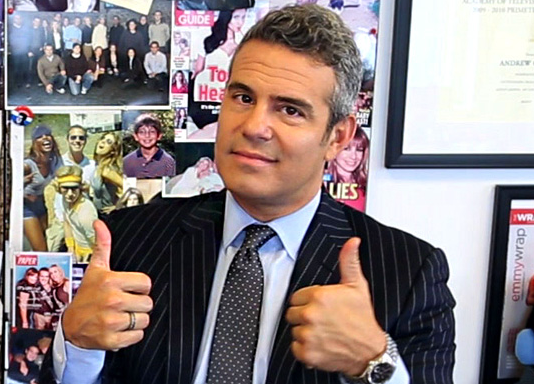 Watch what happens when Andy Cohen’s office gets downsized. Bravo TV has moved offices within 30 Rock from the 46th floor to the 14th floor, merging them with sister network Oxygen. However, the larger space has left little room for the former executive, Mr. Bravo himself, who’s been assigned a tiny new office. Cohen, the Bravo talk host who helped create the “Real Housewives” franchise and won an Emmy for his work on “Top Chef,” had been Bravo’s executive vice president for talent and development until the beginning of this year when he started spending more time on the talent end of the camera. It stands to reason he wouldn’t need as much office space as he once did. Plus, he keeps a second office at his nearby production company. “Now that he’s (no longer an) executive and reduced to just hired talent, he is lucky to have an office at all,” snipped our Bravo insider. A second source familiar with Cohen’s modest new digs calls the office a “a shoe closet” and says Cohen will have to step outside just to change his mind. Talent? him and that other hoe Ryan Seacrest responsible for all this reality show fuckery should never have talent mentioned in the same sentence with these two damn fools.